Vineyards and Thunderstorms | Turning my world upside down! We arrived late after hitting road closures and traffic through Cincinnati. The rain was about to begin and we were glad to pull in to the Chateau de Pique winery. 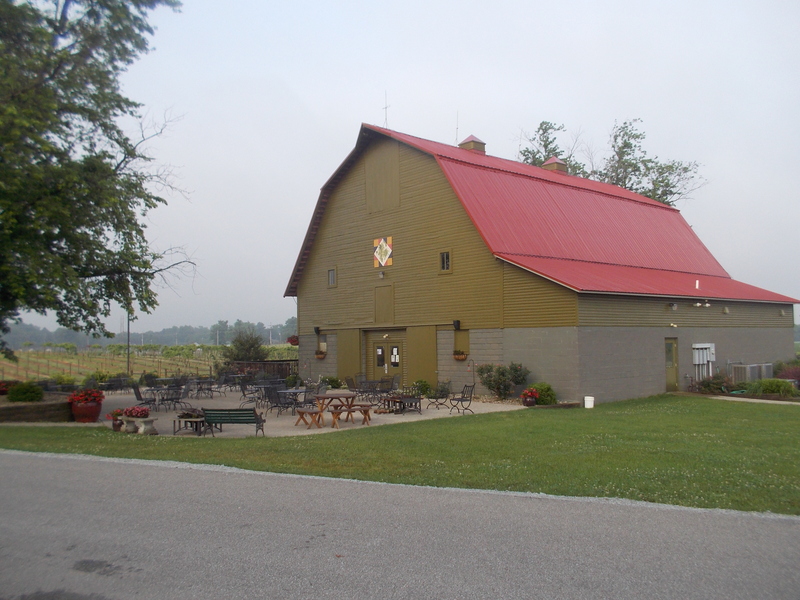 The estate is large, with a refurbished barn as a gift shop and tasting room, some outbuildings, a large party tent that can be seen for miles and what looks a bit like a coliseum. Of course there are vines and a wonderful view of the green corn fields across the road and down the hill. Very little of these details were noticed as we got there, more intent on parking on a level spot as this would be our home for the night. We were alone. Nothing to disturb the peaceful surroundings safe the sound of rolling thunder, frequent flashes of lightning and the hard rain that made it difficult to open windows for some fresh air. No matter. I poured us a glass of wine, lit the lantern and we toasted to Canada Day. Leon and I relaxed from a long day of driving, planning our next stop on this itinerary westward. The doors were open to let in some cool air, even though their insides were getting rather soaked. Once in a while the sky seemed to clear on the horizon, just long enough to see the end of the sunset, but mostly Nature’s fireworks kept us as entertained as if we had been on Parliament Hill. After a leisurely dinner of steak salad, we continued the conversation into the dark, adding some mood music to the ambiance. 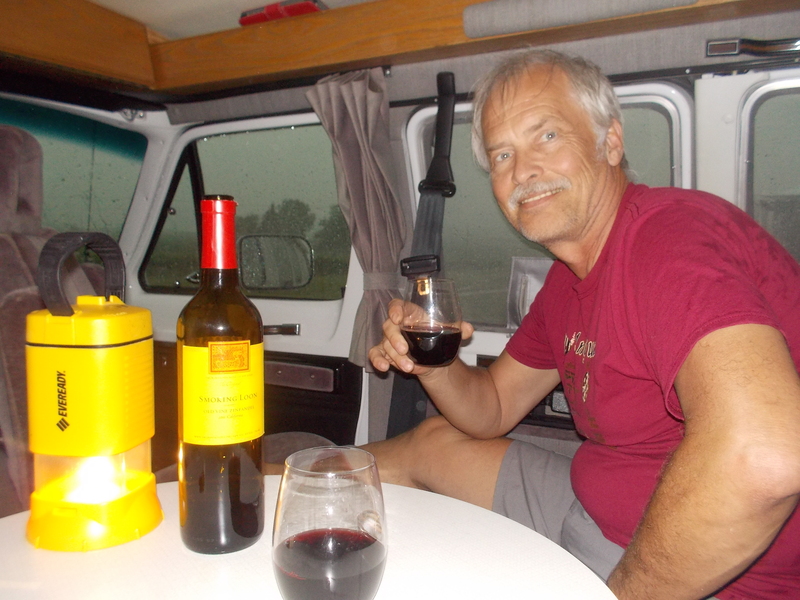 Eventually, the thunder stopped, the rain tapered off and we were able to fall asleep marveling at having a whole vineyard to use as our private campground. We could not have felt richer or more fortunate. We arrived on Canada Day, we had to fly our flag proudly. This morning, we woke to a sunny day and took a brief walk around the grounds. The birds were chirping so loudly, it’s a wonder we even slept in till after 7am. Unfortunately, we never did get to meet the owners of the winery as the shop didn’t open until 11am. We would have been glad to thank them for the lovely Canada Day evening in Seymour, Indiana. Canada Day 2014,was spent in the USA. This was a memorable evening. I love following your campervan travels. Have a great time. Thanks Sheryl. Wait till next year when we tour Oz. Have you bought your own camper yet? Making the best of it despite the weather! Happy Canada Day to both of you! Thanks and happy 4th to you!